Located just south of Independence Pass, La Plata is Colorado’s fifth highest mountain. With easy access and a mild class 2 route that follows the northwest ridge, La Plata is an understandably popular mountain. 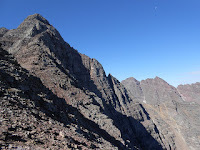 It was also my first fourteener and thus holds a special place in my heart as well. For the more adventurous mountaineer, the Ellingwood Ridge on the northeast flank of the mountain is a long, exciting class 3 route with class 5 potential should you want to challenge yourself on the ridge crest. From the summit of Independence Pass drive east/southeast towards Granite for 6.9 miles to a pull off on the south (right) side of the road. There is a good trailhead here, but there is no car camping at the trailhead itself. If you are coming from the other direction, this parking area is 14.5 miles west of the Highwsy 82-US 24 intersection near Granite. Northwest Ridge (class 2)- the scenic route is the most easily accessible and most popular route on La Plata. It is a mellow hike on a mostly class 1 trail with some scree and loose rock in the last 1,000 feet. It offers tremendous views of the Ellingwood Ridge as you climb toward the summit of this huge peak. Southwest Ridge (class 2)- this quieter alternative is often considered easier than the popular northwest ridge, but is not as easy to access. Ellingwood Ridge (class 3)- This excellent route is a scramble up La Plata’s most rugged feature. This is a long a complicated route with plenty of route-finding challenges. Give yourself plenty of time to do this one. Descend the Northwest Ridge. La Plata is as clean and easy to access as 14ers come. 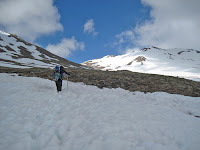 Keep in mind that as opposed to other 14ers, when you get to 14,000’ you still have a good ways to go. There is no camping at the trailhead (although I have heard of people who slept in the back of their cars). There is good camping nearby at Parry Peak Campground just upstream of Twin Lakes, though this spot can fill up on busy summer weekends. From the trailhead hike along up South Fork of Lake Creek Road over a bridge and past some No Trespassing signs. When the road veers right find a trail off left toward the creek. Cross the South Fork of Lake Creek at a solid bridge. The creek looks rather heavy with heavy metals here and there are signs telling you not to drink, even if filtered, from this toxic slurry. Not environmentally sound mining practices of previous generations have badly marred this beautiful stream. Bring enough water with you or filter from Lake Creek (preferably above the confluence of its tributary the South Fork). Continue along the well-defined trail through the woods near the creek’s east bank and cross La Plata Gulch Creek at mile .4. Hike up next to La Plata Gulch creek on its east side for a little over a mile to where the trail leaves the creekside and starts up the steep slopes towards La Plata’s Northwest Ridge. The approach is over. The trail switchbacks steeply up the slope on a good trail for a couple miles, gaining 1,700’ of elevation, before arriving at the 12,800’ saddle. The view of Ellingwood Ridge here is amazing. La Plata also towers above you to the south. You can see much of the rest of the route from here. The trail turns right and begins its ascent of the ridge proper. Though the trail is always present, it does get loose and slippery at times. Watch out for ankle-twisting loose rocks and try not to kick anything down on your climbing partners. You will have to negotiate some minor class 2 sections. La Plata’s proud summits sits amidst a sea of Sawatch giants. Depending on your level of Sawatch experience you will recognize many summits. Enjoy!